Having a party? Walk this way! We've got a new look and loads of awesome spaces you can hire for groups of 6 right up to 300 including our brilliant new ping pong battleground! Fill out our enquiry form to find out more or give us a buzz on 0141 548 1350. Rockin til 3am every night, our basement bar's got loads of comfy booths and tables, a stage for live acts, a dance floor that's always packed and a bar stocked with every spirit you could imagine. Welcome to the Jungle. Booth hire is free for groups of 6 +. Or go the whole nine yards and book out the full basement for parties of up to 300. Parties are better with ping pong! Our King Pong tables are brilliant for birthdays, nights out, work dos, meetings for folk who get bored in the boardroom and loads more. Available Sun - Thurs til 10pm, Fri & Sat til 5pm. Get in touch to find out about hiring our ping pong battleground and our bespoke Party Pong packages. 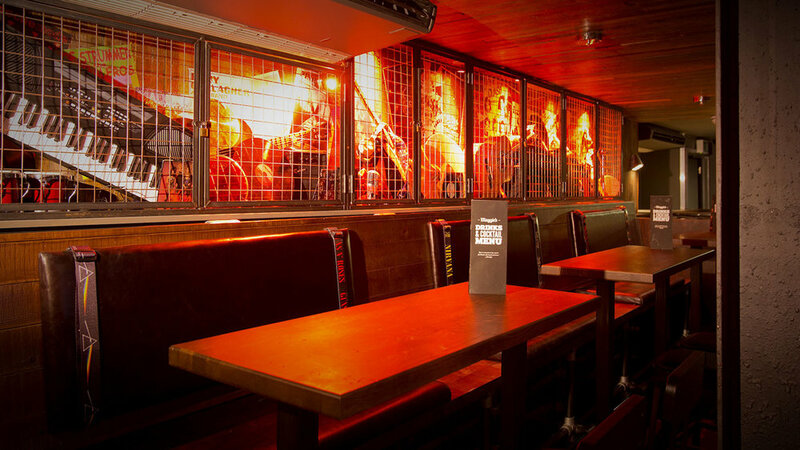 Get right in amongst the action and book a booth in the main bar. Open til 3am with live music every night and all the big sporting events on our big screens. Booths go fast so make sure you stake your claim quick. Maggie's got buns hon! We've ripped out the old restaurant and smashed down the walls to introduce Maggie's Bun - laid back open plan dining where you can book a booth or take over the entire space for groups of up to 80. Where do you want to rock? Basement Bar KING PONG Battleground Main Bar Maggie's Buns Not sure yet!